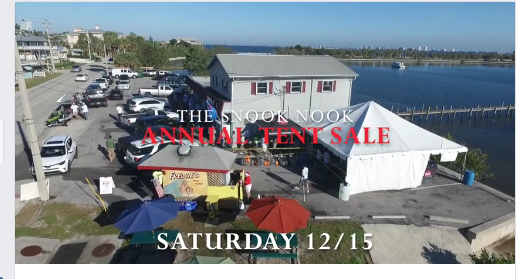 There is only a few days left before the annual Customer Appreciation Tent Sale at The Snook Nook on Indian River Drive in Jensen Beach. The event will start this Saturday, December 15 and run from from 9am to 6 pm. Fantastic deals that only happen once a year will be available on products from Penn, D.O,A., Gulfstream Lures , and Costa Sunglasses just to name a few. One of the highlights will be Billy Carr and Brett Burford from Fishbites will have their own tent and offering a buy 2 bags and get one free promotion on their fantastic baits . Those baits are producing pompano, whiting, bluefish , and mackerel bites along the surf and I do not plan a days fishing without having a few bags in my tackle box. I will be in attendance all day at this event and be happy to answer any and all questions you might have about the great surf run that is happening now. Gary and Nick Zeidman from Penn Reels, Capt Pat Price from Daymaker Charters, and Capt Mark Dravo from Y B Normal Charters will also be in attendance . Fred is also raffling off $10000 dollars in prizes and giveaways during the course of the day!! This event is unbelievable so don't miss it. Hope to see you there. Surf Fishing. Are You Doing it WRONG? These Fish are CRAZY and DELICIOUS! BIG FISH on Tiny Baits! Fishing the First Cold Front - Got 'Em!